Mayor Karen Williams, Natalie Sprite and Robbie Kirk at the launch of anthology Water Stories. 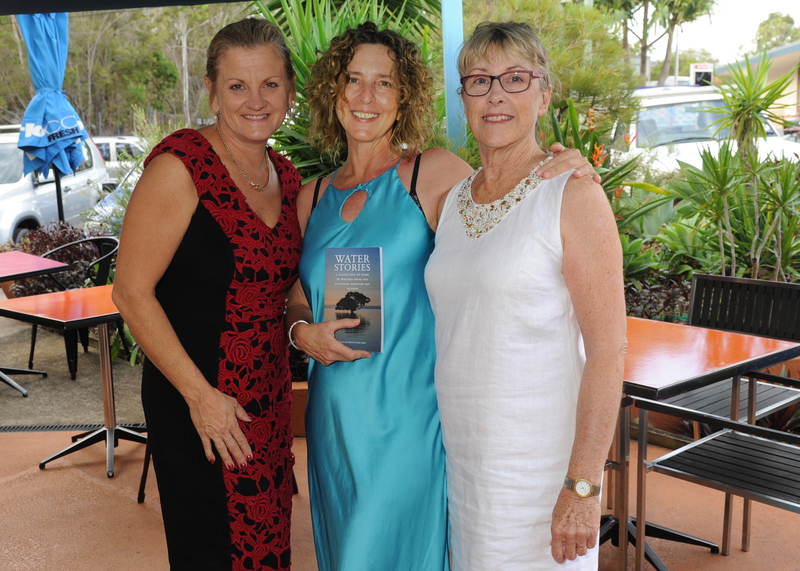 An anthology of short stories entitled Water Stories was launched on February 27 at the Blue Parrot cafe on Macleay Island. The anthology sprung from workshops held for southern Moreton Bay island writers to create and share powerful stories that celebrate and heal. They were given by by tutor and Australian author, Natalie Sprite at the Lamb Island sporting club and the Macleay Island progress hall. Ms Sprite’s previous successful project, People on the Water was also a professional development project for local Island writers. Participant Robbie Kirk of Macleay Island said the workshops were well attended by aspiring authors and including members of the Macleay Island Inspirational Writers group. “The writing course was different from the usual courses on offer in that Natalie led the group through a meditation then we wrote for a time without lifting our pens from the paper. Afterwards what came from my consciousness was often experiences that I hadn’t thought about clearly, or I had squirreled away because of fear,” Ms Kirk said. Lamb Island resident and profession photographer, Russell Dorries photographed 10 authors for the biographies in the book. For Russell and many of the authors this was the first time they have seen their work in print. Ms Kirk said the authors shared their stories through reading excerpts from the book at the launch. Macleay Island’s Mary Veitch wrote song lyrics while attending the writing workshops and she sang to an audience of about 70 people. The book and workshops were financed by an RADF grant and sponsors for the project were Kim Richards MP, Spar supermarket Macleay Island and Pub Paradise. Most of the books have been sold. Australian writer Natalie Spite loves the way art is part of daily, ordinary life in Bali. 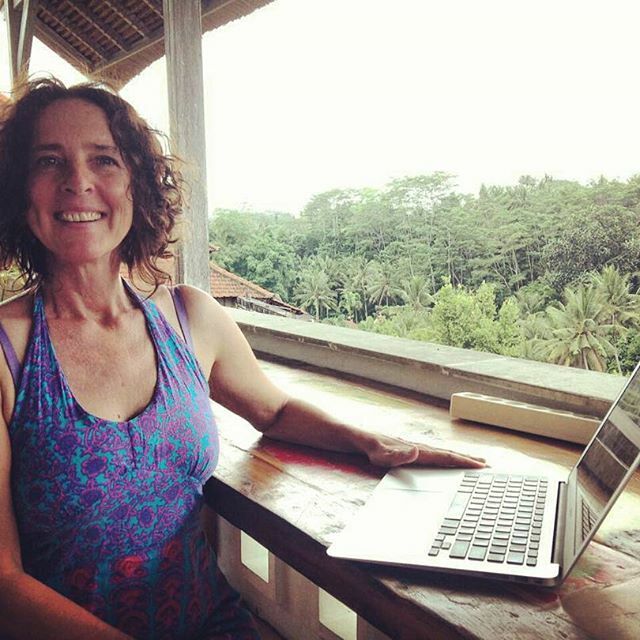 She says being in Bali makes her want to write, which is perfect for this recent recipient of an artist residency grant. Natalie Sprite says she feels both deeply at home and an outsider when she is in Bali and that’s what she want to write about. Short-listed for the 2002 Australia/Vogel Literary Award for her novel ‘Gracenotes’ and a recipient of a number of literary prizes, including the ABC Open Short Fiction Prize and the 2013 and 2014 NT Literary Awards. Her stories have been widely published in literary journals and anthologies including Meanjin, Bruno’s Song and Australian Award Winning Writing. In 2014 she was awarded a Literature Board grant to write her novel, ‘Ripe’. This year Natalie is doing the University of Melbourne Asialink’s Arts Residency Program at Saritaksu Editions in Bali, where she will write a collection of stories exploring the tension between belonging and dislocation in Bali. A mother, a writer. Like all of us, I’m shaped by the things I love. My daughter. My work. As a writer and arts manager for 20 years, what’s been your best moment? It’s always about the process, the moment when I’m deep in the writing, carried on story. When the work itself is leading me. That’s where the joy is. You have quoted Picasso about the purpose of Art being to wash the dust of daily life off our souls. Do you believe that art has power to transform lives? For a long time, I felt apologetic for being an artist. I felt art wasn’t important in the way that saving lives is important. But when I found this quote, I remembered the times that books had pulled me out of darkness. Given me community when I was lonely. Shown me a different way of being when I needed wider vision. I thought about how impoverished life would be without art. Working in community arts, too, changed the way I saw art. A lot of the projects I worked on I was collaborating with people at the margins and people recovering from trauma. Art gives a space for large emotions. Huge grief. Explosive love. Terror. Things that don’t fit into a small talk context. And then there is the simple act of creating as a group. Creating in this way provides community and connection in a gentle but genuinely powerful way. As you’re from Darwin, you will have been exposed to Indonesian arts and culture there. What’s been your reaction to it? The closeness of Indonesia is one of the things that makes Darwin vibrant. The collaborations between Darwin and Indonesian artists are producing some really stunning work. Monster Art, for example (a recent exhibition of Indonesian and Darwin artists, at the Museum and Art Gallery, curated by Andy Ewing and Fiona Carter) was extraordinary. Just amazing. You have chosen Bali for your arts residence, why? I feel both deeply at home and very much an outsider when I’m in Bali. It’s this tension I want to write about. There is a long and not always easy history between Bali and Australia. I find the stories around this compelling. There are acts of love and cruelty and foolishness and generosity. On both sides. And across all of this, there are moments of genuine connection and intimacy. This is I want to write about – these moments, and how to touch this place I love with lightness. Have you been to and lived in Bali before, if so what changes have you seen in this ‘Island of Gods’ ? I have visited Bali every year for the last seven years. I find the increase in development disturbing, but I’m aware, too, that the development is happening because of people like me. Sometimes it seems that Bali is being almost loved to death. A friend said to me the other day, “If you love Bali, maybe the best thing you can do is to stay away.” I’m not sure this is true. But I’m aware that tourism is a double edged sword. What is your perspective on Balinese arts and how they are connected to your own passion as an artist? It’s the Balinese approach to beauty that fascinates me. In Bali, beauty has a spiritual note running through it. It is not empty decoration. In Australia, it seems like we’ve grown distrustful of beauty in art. But I love beauty. I find it necessary and deeply connected to hope and possibility. I also love the way that almost everybody is an artist in Bali. Art is not separate from the rest of life. It is daily and ordinary, yet carries with it a deep soulfulness. What will you be doing in Bali during your residency? My host for the residence is Saritaksu Editions, a publishing house based in Sanur. Sarita Newson is the managing director and has offered to connect me to the Indonesian writing community, for which I’m so grateful. I need community. The chance to meet and talk to other artists is one of the great strengths of the Asialink fellowships. I’ll also work with Saritaksu as a reader and am looking forward to learning more about the process of publishing. At the end of the day, the focus of the residency is writing. Bali makes me want to write. There is something about the contrasts of the place that take my practice up a level. I want to write about all that I love and all that I find confronting. To feel it sink into my skin and my work and see what comes out. ‘Like’ Australia Plus on Facebook for more stories like this. Read this story in Indonesian on the Australia Plus Indonesian language site.